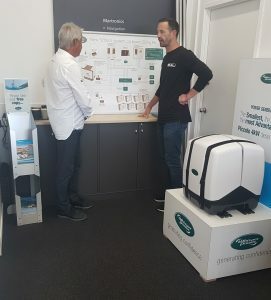 WhisperPower, thealternative energy powerhouse from the Netherlands, has appointed EAL as its primary Auckland dealer (marine). John McGettigan (left) with Jasper Hannay of EAL. Effectively creating a one-stop-shop for on board power needs, it adds WhisperPower’s ground-breaking super-quiet and vibration-free generators and advanced alternative electrical systems to EAL’s line up. Its products include marine systems and individual products which cover both the marine recreational and commercial markets with a broad spread on offer including well-performing energy systems and back ups, alternator systems, battery chargers, sine wave inverters and many more. EAL’s Jasper Hannay is looking forward to spreading the word on WhisperPower’s ‘new school systems to EAL’s customers from its Westhaven Drive central location with the agreement following a relationship of many years between the two companies. Taking on EAL as its primary Auckland dealer has allowed WhisperPower to move into warehousing in Albany while it focuses on expanding its dealer network throughout Australasia. This has included another recent move; the company’s Brisbane office has shifted into the heart of the Gold Coast Marine Precinct with Jason Rendle, Australian general manager facilitating this across both marine and mobile markets. WhisperPower achieves lower fuel use, noise, weight and size while giving the user seamless operation and confidence anywhere in the world through its extensive global support network. WhisperPower is a power systems manufacturer capable of providing a complete solution, with truly international seamless operation and support. We promote a new school approach to alternative power systems. GENVERTERS, POWERCUBES, LITHIUM STORAGE, HY-GEN AND HYBRID are words WhisperPower use to describe the building blocks of our highly efficient systems.